Crocus plants – Spring is coming! Well here we are – the #HealthyMarch challenge. Instead of going to the gym, I decided to put on my running shoes, and go for a run. I’m not keen on running in the cold and running in cold weather with a sprinkling of rain, is even worse. However, as it was day 1, I felt it important to start the month with a running challenge and just get on with it. I’ve never been one to worry about running gear but decided to put on a proper running top and long sleeved sweat shirt in order to keep warm. Lightweight layers of breathable clothing, known as the layer system, is always advisable when running in the cold weather. My phone is a music facilitator and running calculator as it is important to be aware of how beneficial the running is for health and fitness. All in all it is a palaver getting ready. What with the clothes to keep warm enough and the running accessories plus choosing the music, route and remembering the water bottle. Eventually, I set off for the first outside run of the year. Usually, a run once a week on the treadmill and running exercises in the gym, keeps me going during the winter months. I start slowly by walking to the village main road and then increase the pace with some gentle running which prepares the muscles for exercise. As I run in the drizzling rain, I wonder if I’m slightly mad, and feel self-conscious. 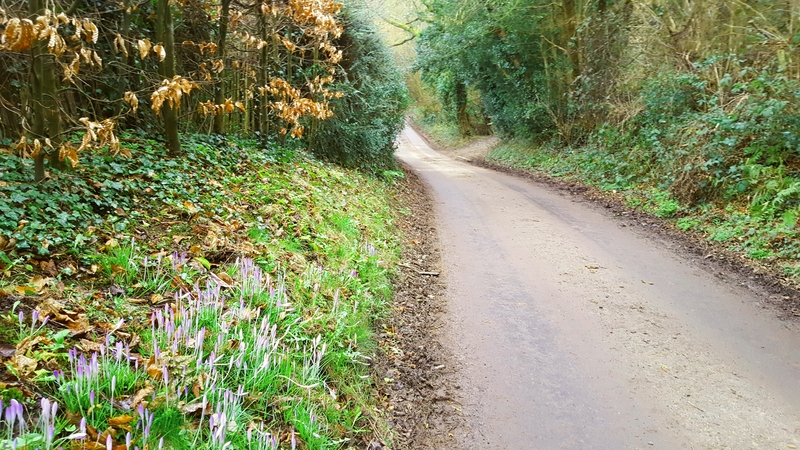 As I run away from the busy main road towards local, quiet roads, I develop a pace and become warmer and start to enjoy the slow rhythm of pounding feet and start to remember that I actually quite like running. Well I say, running, I did stop to take rather a lot of photos for this blog. 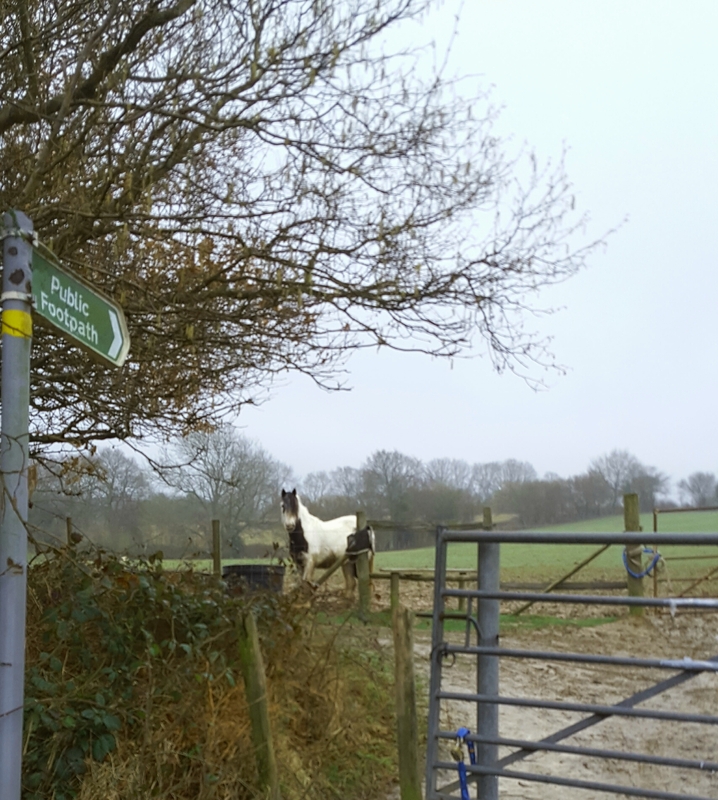 Although I stopped to take photos, including the friendly horse, I felt a sense of achievement and it made a nice change which helps to get me out of that winter exercise rut. By the way, the horse was really sweet and seemed happy to pose for a photo. He met me at the gate as I strolled over, and didn’t seem too disappointed about the lack of sugar lumps. The moment brightened up my day too. As I was running back towards home, I must admit to feeling the run was exacting but felt pleased I made the effort and I slept well too which is a good thing. To cool down, I reduce my pace to a fast walk for five to ten minutes. This helps the body recover after running and anyway I was tired! I hate running in the cold! I can’t breathe through my nose properly so I always get home with red throat. Can’t wait to get warmer again so I could go out. Thank you for the motivational post! What a motivating post. I’ve been treadmilling in the gym for the past few winter months, but the itch to get back outside has been growing stronger and stronger every day. As you so aptly describe, running untethered to the machine requires much more logistical prep, and then there’s the psychological hurdle with respect to chilly, wet weather. However, I suspect you sent a bit of that motivation my way. It’s time to go for a run. Thank you for sharing this wonderful post with us! It is hard to get going in the cold weather. We are in the end of Summer here and I ran in a 10km fun run on Sunday. It was hot! Keep up the good work. I’m running Fit & Fabulous March over at my #couchpotatotofabfit Facebook group. I’d love you to join us.